A tenured professor of sociology, Dr. Adina Nack received her Ph.D. from the University of Colorado, Boulder and joined CLU in 2003, after having been faculty at the University of Maine. At CLU, Dr. Nack has served in the past as Chair of the Sociology Department, Director of CLU's Center for Equality & Justice, and as the Director of CLU's Gender & Women's Studies Program. Dr. Nack is a medical sociologist whose research has focused on sexual health, social psychology, social inequality, gender, and sexuality. An award-winning teacher, she has also won national research awards, published articles on the stigma of sexually transmitted diseases, and authored a book on women living with genital herpes and HPV infections published by Temple University Press in 2008. 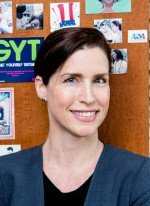 Her co-authored article was recently published on a study of women who have had abortions with a focus on theorizing their individual-level stigma experiences [Co-PI Kate Cockrill from ANSIRH, University of California - San Francisco]. She is currently collaborating on an in-depth interview study of physically traumatic childbirth experiences from the perspectives of the women, their significant others, and health care providers [Co-PIs from CLU and also from CMQCC, Stanford Medical School]. A proponent of community-based action research, Nack was a Co-Principal Investigator for Ventura County’s two studies of Latinos/as receiving HIV/AIDS services (funded by the California State Office of AIDS). The first study inspired the 2006 countywide HIV & Latinos: A Leadership Summit which led to the creation of the Latino HIV Taskforce. In addition to her work with VCPH, she has also served as a research consultant for the ELCA Sexuality Studies Taskforce, Western Institute of Hearing, United Women's Leadership Council, and AIDS Desk (Chennai, India). A member of the HIV/AIDS Coalition of Ventura County since 2003, Nack chairs the county's World AIDS Day Committee. 2015. “First Comes Love, Then Comes Herpes: Sexual Health and Relationships.” in Families As They Really Are (2nd Edition), edited by Barbara Risman and Virginia Rutter. W.W. Norton & Company: New York City, NY. 2013. Co-authored with Kate Cockrill. “‘I’m Not That Type of Person’: The Stigma of Having an Abortion in the Contemporary U.S.” Deviant Behavior, 34(12): 973-90. 2011. “From Damaged Goods to Empowered Patients” in Sociologists in Action: Sociology, Social Change, and Social Justice. Edited by Kathleen Odell Korgen, Jonathan White and Shelley K. White. Newbury Park, CA: Pine Forge Press/SAGE Publications. 2015. Reprinted in Sociologists in Action on Inequalities: Race, Class, Gender, and Sexuality. Edited by Shelley K. White, Jonathan M. White and Kathleen Odell Korgen. Newbury Park, CA: Pine Forge Press/SAGE Publications. 2008. “From the Patient’s Point of View: Practitioner Interaction Styles in the Treatment of Women with Chronic STDs” Pp. 95-122 in Major Health Problems and Population Health Concerns: Impacts on Patients, Providers and Policy. Edited by Jennie Jacobs Kronenfeld. WA, UK: Emerald Group Publishing Limited. 2008. Damaged Goods? Women Living with Incurable Sexually Transmitted Diseases. Temple University Press. 2009. Excerpt of Chapter 1 “Mixing Morality with Medicine” in Speaking of Sexuality: Interdisciplinary Readings (Third Edition). Edited by J. Kenneth Davidson, Nelwyn B. Moore, and Terri D. Fisher. Oxford, UK: Oxford University Press. 2006. “Sexuality over the Lifespan: Social Trends Pose Moral Dilemmas for Communities of Faith.” Intersections (Spring): 16-20. 2013. “Film Review: Sext Up Kids: How Children Are Becoming Hypersexualized.” Humanity & Society, 37(3): 259-261. 2007. Review. Gender, Race, Class, & Health: Intersectional Approaches by Amy J. Schulz and Leith Mullings. Gender & Society 21 (2):297-8. 2001. Review. Ideologies of Breast Cancer: Feminist Perspectives edited by Laura K. Potts. Contemporary Sociology 30(3):300-01. 2010. “Why Men’s Health is a Feminist Issue: As New Uses are Approved for the So-Called Cervical Cancer Vaccine, Women Learn Once Again how Intimately their Well-being is Tied to Men’s.” Ms. Magazine (Winter):32-35. 2007. “A Search for Truth and a Call for Freedom.” CLU Magazine (Summer): 21. 2005. “A Visit from the GLBT Fairy Godmother.” in the ASA Teaching Guide: Teaching Sociological Concepts and the Sociology of Gender. Edited by Marybeth C. Stalp and Julie Childers. Washington, D.C.: American Sociological Association Teaching Resources Center. 2002. “Empathy as a Path to Critical Thinking.” SWS Network News: The Newsletter of Sociologists for Women in Society 19 (4):9-11. 2000. “Out of the Stirrups and into Stigma: Creating a Sociology of STDs.” SWS Network News: The Newsletter of Sociologists for Women in Society 18(2):8-9. 2018-19 “Women’s Experiences of Severe Maternal Morbidity in New York City”: Research consultant with Dr. Christine Morton (Stanford University Medical School), in collaboration with New York City Department of Health and Mental Hygiene with funding from Merck for Mothers. 2005-06 Funded Research Collaboration: California State Office of AIDS. Co-Principal investigator with Dr. Lyn Gesch, in collaboration with Ventura County Public Health and Ventura County AIDS Project: Latino Men Living with HIV/AIDS.